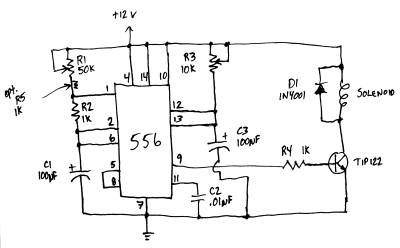 How to do to prevent a 556 timer IC from becoming too hot? The values used allowed me to have intervals from about a half-second all the way up to nearly a minute. The drive or "high" time controlled by the monostable timer (R3 and C3) allows for timings between a few milliseconds to a few seconds. I added R5, a 1K resistor, later to ensure that the interval wouldn't go below a few hundred ms. It's been running quite well, actuating the solenoid at regular intervals as designed. The TIP122 transistor is barely warm, the solenoid is within normal temperature for its duty cycle, but the 556 timer IC is too hot to touch. It's been operating continuously for 24+ hours without any failures, but I am concerned because I think that this IC should not be warm at all. I’ve read the details of 556(http://www.kynix.com/Detail/1126840/NE556.html), and still have some questions. Is there something I overlooked in this schematic that should be done to prevent excess heat in the IC? I haven't (yet) measured current usage by the IC alone, but the total circuit draw is 125 mA on standby and 2A when the solenoid is actuated. Running on 12 V is pushing the limits of the device quite a bit more than it would to run it at a lower voltage. 125 mA at 12 V gives P = I * V = 1.5 W of power, and since there aren't any direct routes around the device from +12 to ground, that is all being dissipated inside the device. That's well over the maximum power dissipation of the device -- typically 0.8 W.
You might consider using a separate voltage regulator, perhaps a 7805, to drop the input voltage down to 5V (and allowing it to dissipate most of that heat), and just have the high end of the solenoid connected to 12 V.